Making calls from a cell phone with no battery, using just the warmth of your hand? Perhaps that’s no more than a pipe dream right now. But new circuits are already making it possible to harness body heat for generating electricity. Numerous items of medical equipment are attached to the body of a patient in the intensive care ward. They monitor the heart rate, blood pressure, body temperature, pulse and breathing rate. This tends to produce quite a jumble of cables, for all these devices require their own electricity supply. In future, medical sensors may be able to function without power from a wall socket. Instead, they will draw all the power they need from the warmth of the human body. The respective data will be sent by a radio signal to the central monitoring station. 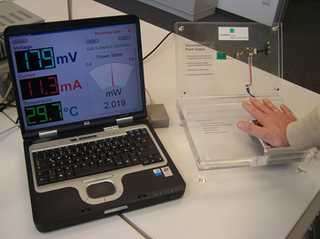 In collaboration with colleagues from the Fraunhofer Institute for Physical Measurement Techniques IPM and the Fraunhofer Institute for Manufacturing Engineering and Applied Materials Research IFAM, research scientists at the Fraunhofer Institute for Integrated Circuits IIS in Erlangen have developed a way of harnessing natural body heat to generate electricity. It works on the principle of thermoelectric generators, TEG for short, made from semiconductor elements. The TEGs extract electrical energy simply from the temperature difference between a hot and a cold environment. Normally, a difference of several tens of degrees would be required in order to generate enough power, but the differences between the body’s surface temperature and that of its environment are only a few degrees. “Only low voltages can be produced from differences like these,” explains Peter Spies, manager of this sub-project at the IIS. A conventional TEG delivers roughly 200 millivolts, but electronic devices require at least one or two volts. The engineers have come up with a solution to this problem: “We combined a number of components in a completely new way to create circuits that can operate on 200 millivolts,” says Spies. “This has enabled us to build entire electronic systems that do not require an internal battery, but draw their energy from body heat alone.” The scientists are making further improvements to this system: Circuits that are “excited” at 50 millivolts already exist. Peter Spies believes that in future, when further improvements have been made to the switching systems, a temperature difference of only 0.5 degrees will be sufficient to generate electricity.